This is based on unique sessions over a short period of time, so it’s not likely to be all that accurate. D-does neoreaction have a woman problem? Is it time for me to include more pink? 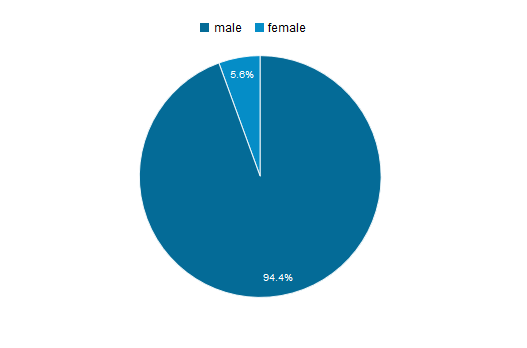 Also, can you believe how cis-sexist analytics packages are? With the majority of the readership over 25, that puts a needle into the criticism that all of you are too young. 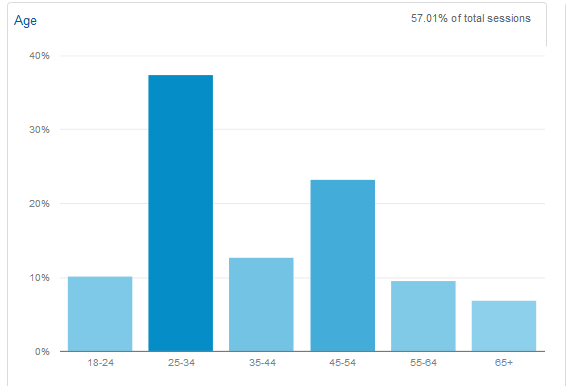 It’s a good deal grayer than I expected it to be, with more than a third of you being middle aged or older. 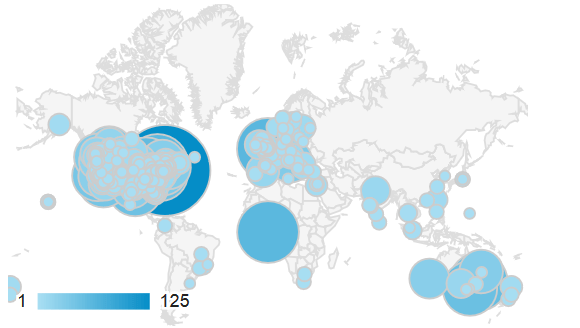 Looking at a city-by-city basis, you’re all very spread out. The two largest cities are the two capitols of the Anglosphere, being New York and London. Everything else is spread very thin. The bulge in West Africa is actually for users for whom the software could not establish a location for. This is based on a limited sample and is only modeled based on Google’s interpretation of your cookies and IP. After the release of the ‘Easy Meat’ report (which I read and summarized in that link), some predicted that the country would reform its ways and kick out the slavers. Instead, roughly nothing has happened, although it has been used for a good headline on a UKIP advertising campaign. For this ad, many prestige publications attacked the party, rather than perhaps considering the problems in their society that lead to tens of thousands of girls being enslaved for profit (often enormous profit, exceeding £600,000 annually per girl). While there has been some bureaucratic shuffling here and there, and a few concerned newspaper headlines, essentially nothing has been done, and in fact the original report has been largely ignored in favor of the soundbite-friendly ‘1,400’ number, and the localization to a single region when the original report substantiated complaints to the entire country and the broader region of Northern Europe. Because this has been a long term pattern in the UK, we should not expect anything to change on a dime. In fact, we should expect the problem (which is only a problem for white Britons — for slavers, it’s a bonanza of profitable pleasure) to become considerably more acute, and more widespread over the next decade. Since the UK has elected to pursue the enlightenment system of reformatory criminal justice, we should expect more Muslim entrepreneurs to respond to the enormous profits that even an idiot can scoop up in front of the playgrounds of UK schools for the cost of a six pack of lukewarm beer. The worst that the state can do is put a person into a brief vacation-type jail sentence, after which he is free to return to his former line of crooked employment. When a single kidnapping can provide more money in a year than a typical British person is likely to earn in a lifetime, you’d be quite stupid, at least materially speaking, to enter any other business. Further, kidnappers seem to enjoy higher status than most other classes of UK businessman. For one, to be of diverse descent is to automatically enjoy a protected status. For another, it creates no emissions, it’s a green business, it requires no factory equipment, and most of the front line workers are young women. The country that piously abolished slavery is becoming incapable of condemning the enslavement of its own population. It has become so accustomed to being able to issue moral complaints about other societies without actually having to do anything themselves that, when a moral crisis appears, it has no capacity to act in a meaningful way. It can create bureaucratic task forces and place charities on watch lists, but to take decisive action has become politically unspeakable. If we accept the proposition the women of a country are its future, we should translate that into the observation that the future of the United Kingdom is slavery. The West, accustomed to being on top of the world, may soon find big parts of itself being seized and trundled off to foreign hoards. Having lost the will to live, to defend itself, having taken the reflexive pose of toleration without regard to what is to be tolerated, it is losing its freedom. We should also consider, that historically speaking, for such things to happen is not beyond the pale, and is actually quite normal. For all of Europe to be free of Oriental despotism of all kinds is odd. What is normal is for big swaths of what we call European countries to be dominated by foreign invaders for centuries at a time. This was certainly the case until World War I decimated the Ottomans, and it was the case before the Ottomans made Constantinople their new capitol. Also, it is not ‘the people’ who wake up and resist the invaders. It’s also not typically ‘one great man’ who emerges from ‘the people’ to push them back. Far more typical is for the aristocracy to make a good living selling their own people out to the invaders, whom they are too weak and weak-willed to resist. When a people are broken, everyone is broken, from bottom to top, and whatever deliverance may be forthcoming typically comes from outside, and at a different time.